The species tyrannosaurus rex, is one of the most well-represented of the large theropods. Tyrannosaurus was a bipedal carnivore with a massive skull balanced by a long, heavy tail. Fossil evidence shows that theT. rex was about 40-feet long and up to 20-feet high! This tyrant lizard was on the largest carnivores that ever lived. 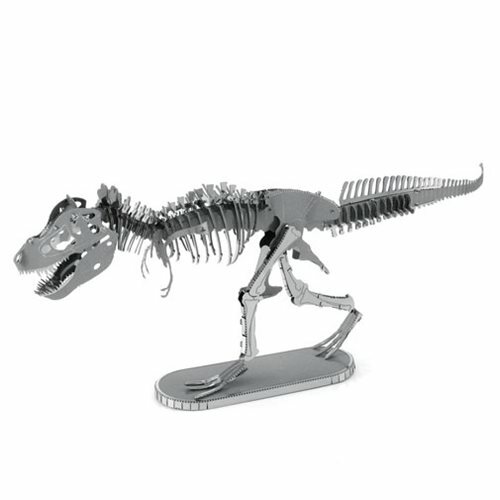 Assemble your own carnivore with the Tyrannosaurus Rex Skeleton Metal Earth Model Kit! Use the easy-to-follow instructions included with the sheets to pop out the pieces, bend the tabs, and connect them at the attachment points! Ages 14 and up.